As my contribution to June Is Audiobook Month, I'm going to do a post a day about books that I've particularly enjoyed recording over the course of my career--those that are still available, of course. Even if you don't want to listen to them, you might get some good ideas for reading! Today we'll set the Audiobook Wayback Machine to 1984 when I was a young narrator for the Talking Books program in Washington D.C. and was invited by Flo Gibson to join her fledgling company, Audio Book Contractors. Flo passed away earlier this year after a long and fruitful career narrating the great classics. She managed to top a thousand titles before failing health made it impossible for her to record. We young folks would take the bus over to Foxhall Road, a very ritzy part of D.C., where the maid would admit us to the basement of her palatial Georgian home. Usually there were snacks or hors d'euvres left over from some fancy event the night before, and we'd walk to a nearby gourmet store and buy a bottle of wine to sip while working. On hot summer days we could take a dip in the pool. Flo's husband Charles, a retired Chilean diplomat educated at Eton, would occasionally drop downstairs to chat and offer the fellows a cigar. At some point Flo was sure to burst in and whirl around for awhile, complaining about an argument she was having with Polly Roosevelt or boasting about her lunch with Barbara Bush. It was a remarkable place to work. Eventually she started contracting to Books On Tape, which is what launched several of us on our commercial careers. 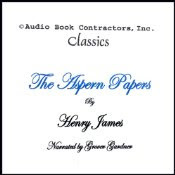 Anyway, one of the first titles I did for her was The Aspern Papers by Henry James. It's remained a favorite of mine after all these years. There are several version on Audible, but I'm amazed at how well this one holds up, even though the recording was sourced from old reel-to-reel tapes. I was probably smoking a cigar and sipping Cabernet as I read, which would account for some of the liberties I took in the more dramatic passages! The climactic scene sends chills down my spine to this day. And don't you love the cover? This is for the Audible re-issue. Always frugal, Flo kept packaging costs low by photocopying typewritten cassette labels and tucking arty postcards into the plastic slipcases. Thank you so much for taking the time to write about your early narrating experiences. This really was a highlight for me today. I love all these images. I hadn't heard of Flo until I saw her obit this year. She must have been an entertaining lady. I cannot begin to thank you and all the other people involved with audiobooks. My sight is getting a bit wonky and I cannot knit and read (at the same time) any longer; listening to audiobooks is wonderful. *Thank you* for the work you do. I hadn't heard that Flo Gibson had died. She's been a perennial favorite in our house, from "Pride and Prejudice" through "Uncle Vanya." May she rest in peace, and may her voice live forever.